He revealed that their final words to each other were, "I love you." One week after his wife was killed aboard a Southwest Airlines plane, Michael Riordan is speaking out publicly for the first time to share how he and his family are coping with the tragic loss. “She’s going to be with us forever and everything we do as a family is going to be based on Jennifer Riordan,” Michael Riordan told NBC’s Joe Fryer during an interview Tuesday on "Nightly News." Riordan said the family is choosing to focus on Jennifer’s life and remembered his wife of more than 20 years as someone who spread love and kindness, and was constantly sending inspirational text messages to friends and family. 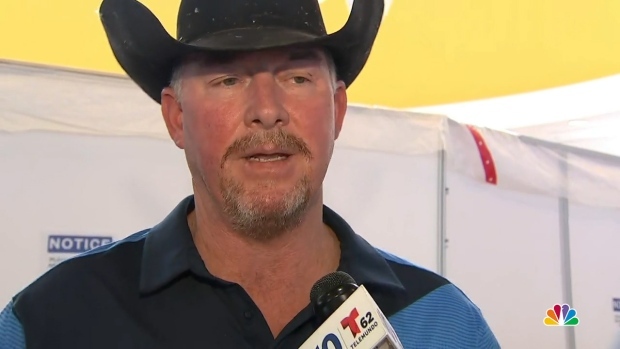 While continuing his life without Jennifer, 43, has not been easy, Riordan said the couple’s two children have given him strength. 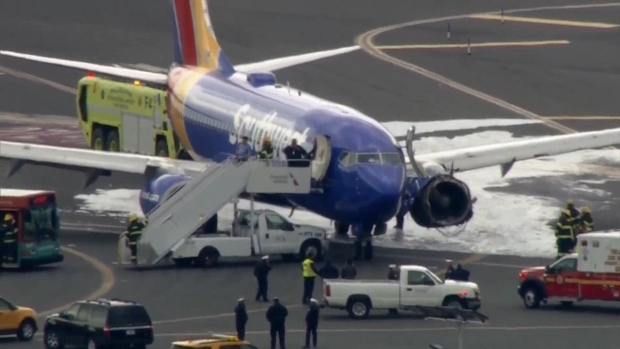 Listen to the communications between the pilot of Southwest Flight 1380 and Air Traffic Control at Philadelphia International Airport as the plane came in for an emergency landing. "I have not been angry yet," he said. "I’m sure it’s coming. I’m keeping my love for her in my heart and I’m staying strong for my children, and I’m soaking in their looks to me." The Wells Fargo Bank executive had been heading home from a business trip last Tuesday on a flight from New York's LaGuardia Airport bound for Dallas. Early in the flight as the plane was at 32,000 feet (9,754 meters), one of its twin engines suddenly exploded. The impact showered the jet with debris and shattered the window next to Riordan. Authorities said Riordan was fatally injured when she was sucked partway through the window, sending passengers scrambling to help her as the aircraft shook violently and went into a rapid descent. The plane made an emergency landing in Philadelphia. Riordan was the only one of the 149 people on board who suffered fatal injuries. In an interview with CBS Tuesday, Riordan, a former chief operating officer for the city of Albuquerque, recalled the phone call that changed his life. "There was a chaplain from a hospital that called and he said, 'well I'm from Philadelphia'... and I said, 'well, my wife was flying to Chicago today so you must be looking for somebody else.' [The Chaplan] said, 'No, there was a plane that was diverted here. I'm going to have to have a doctor give you a call.' Then the doctor called and said, 'I'm sorry, Michael, but we've done everything we can but we couldn't save her,' and I just dropped the phone," Riordan told CBS News' transportation correspondent Kris Van Cleave. He then made the "worst" calls of his life to Jennifer's parents while trying to figure out how to tell their children that their mom wasn't coming home. Riordan said on "Today" he is not ready to speak about the accident that killed his wife or the investigation currently underway, but revealed that their final words to each other were, "I love you." "Our last conversation was that. She called just to say, 'I'm going to the airport,’ and we said, 'love you, safe travels,'" Riordan said. On Sunday, hundreds of people turned out to remember Jennifer Riordan at service at Popejoy Hall on the University of New Mexico campus, her alma mater. "She was the face of giving. If you were an idea or a dream that needed a little help, she was your gal. Her currency was compassion," said Albuquerque poet laureate Hakim Bellamy, who read an original poem at the memorial. "The kind of kindness that folds like a hug like a laugh like her wings before she was so close to heaven that the angles recognized her and plucked her from the sky." Her 10-year-old son, Joshua, called her "an amazing mom."